I set a date! Mark your calendar for the evening of Wednesday, June 18th. 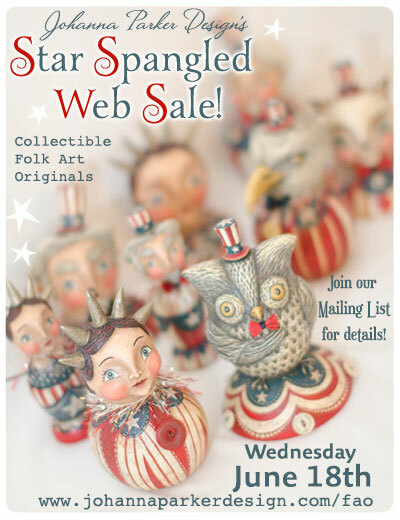 Just one week from today, I will be hosting my Star Spangled Web Sale on my Folk Art Originals Page. This small collection of 9 one of kind Americana characters will be available. For more information, including the sale's start time, etc… please Join our Mailing List! (If you have already joined, there is no need to join again. You will be receiving our newsletter soon!) In the meantime, here is a fuzzy sneak peek of my red, white and blue crew!